Item number N2.677 from the MOA: University of British Columbia. Round paper hand fan with a bamboo handle. 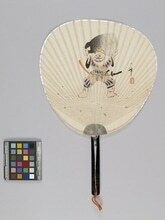 One side of the fan features a warrior in battle costume. Polychrome on white ground. Black and gold handle. Plain back. Orange fibre cording is looped and tied through a hole at the end of the handle. Collected by the paper making library & museum, Tokyo, between 1957 and 1959.